Here are pictures of me wearing the shirt I made out of the Shiba printed fabric. (More) By “made”, I mean that a friend of mine actually cut it out for me and sewed the collar and I pretty much got the rest together with sheer luck. Pockets! This is the big pocket with a mushroom button that Etsy seller sonatine sent along with the fabric. I made a paper Shiba! I posted about this almost exactly a year ago on March 30, 2009. On Monday, March 29, 2010, I printed out the paper Shiba on the Canon Creative Park site. The pictures below prove that, after three hours of cutting, cutting, cutting, pasting, pasting, cutting, pasting, fiddling with the damn paper, trying to get it to look like the picture… I have a paper Shiba. 1) The first thing you note is that my Shiba appears to have a skin condition. This is because there was a torrential downpour when we ran from my friend’s house to the car. Rain + inkjet printed paper = paper Shiba that will never win a show. 3) There are suspicious red markings that look like missed guidelines. Nope, I didn’t hit them all. And I’m not sorry, you hear! Not! This was a fun project, but did it ever take a long time to cut everything out. Check out the .pdf in the link above – there are 6 sheets of stuff to cut! I used Aleenes Original Tacky Glue, which dries pretty fast and a crappy pair of scissors. Next time, I’ll still use the Tacky glue, but I’m getting a better pair of scissors – actually two; a medium-sized one to cut out the general shapes and a short, thin, pointy-bladed set for cutting the little tiny wedges that this project takes. On the weekend (well technically on Monday – I stay up too late), I got a half-yard of this fabric from Etsy store sonatine. It was mentioned on the page that this was the last piece of fabric and I’m not sure if they’re getting more in. It was $6.80 USD plus $4.80 shipping, which ended up being 12-something in Canadian funds. I’ve had my eye on this fabric for a while now, but the notice that it was the last piece spurred me to buy that last half-yard. I had wanted to make a short-kimono-style shirt, but I’m not that tiny! Maybe I can make a travel-bag for Tierce, since he accompanies us on many outings and his stuff usually gets thrown in with mine. I have been cornering the market on these stickers, but Coco has 1 or 2 sheets left! They are a lot smaller than the first photograph suggests, but there’s a pic with a ruler to give them some perspective. They are the cutest stickers ever! I just bought my first sheet and ordered 3 more from the store – very cheap and Coco is an awesome seller; fast shipping and prompt replies to emails. 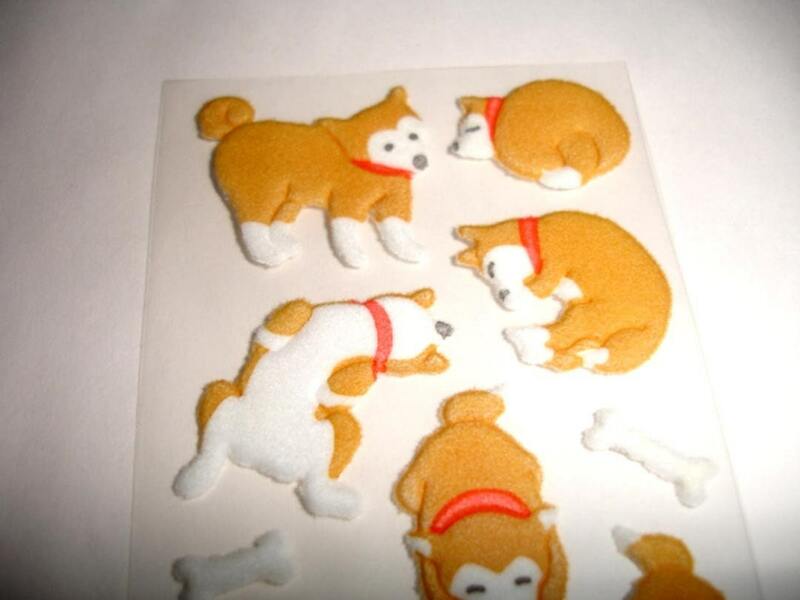 Head over to eBay.com and type “MSIR” into the search box to get the latest and greatest of Shiba inu merchandise. Nikko’s Mama sent me this link in the comments a while ago and I had intended to feature it in a blog post… a while ago. I want to make one of these so bad, but it’ll have to wait until I can get more ink for the printer.